She scrubs and scrubs, but that stubborn stain of guilt and carnage just won’t come clean. Ladies, are you tired of the workaday drudgery of clearing away the evidence of your near-fatal gunshot wound? Have your impulsive, demonic maledictions left a waxy build-up on those hard-to-reach places that you used to call your heart and soul? Yes, for the first time in several months, Dark Shadows looks like something that could possibly belong on television. Angelique’s got your standard 1960s housewife dilemma — yesterday, she discovered that her husband Barnabas was planning to run away with his ex-fiancee Josette. To force him to stay, Angelique used a voodoo doll to torture his ten-year-old sister. He responded by shooting Angelique in the shoulder, and she — like any self-respecting housewife would — unleashed a nightmarish, demonic curse that any minute now is going to turn him into an undead ghoul. This is what happens when you try to have both a career and a family. But, obviously, the thing that really upsets her is the housework. Never mind the forces of eternal darkness gathering in the shadows, what are you going to do about those stubborn stains? Honestly, the only thing they need to make this the perfect sitcom premise is for one of the following people to show up at the door: the nosy neighbor, Barnabas’ boss from the advertising agency, or her mother-in-law. So guess who turns up at the door? The mother-in-law! 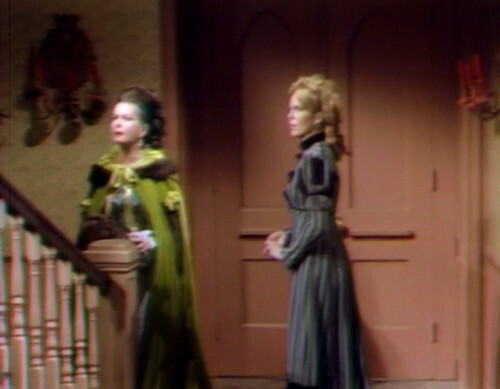 Naomi knocks several times, and for a moment, Angelique considers just pretending that she’s not home. The theremin music starts up, emphasizing the chilling suspense of avoiding your in-laws. But Naomi didn’t get to be the tri-county sherry-drinking champion of the world by letting a closed door stand between her and a decanter. When she pays a social call, she expects you to live up to your side of the bargain. She just opens the door and walks right in. So here she is, the modern housewife, with a mortally-wounded husband upstairs and an indelible bloodstain all over the decor. To reinforce the sitcom motif, Lara Parker is struggling to remember her lines, and her regular glances at the teleprompter look like a classic Jim Halpert Dunder Mifflin-style take to the camera. 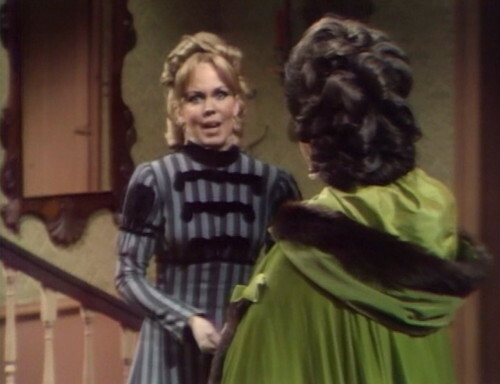 Naomi: I’ve come to see Barnabas. Would you tell him I’m here, please, and want to talk to him? Angelique: Oh, I’m afraid that’s impossible. Angelique: Because he’s… well, he’s not here. Angelique: He didn’t say where he was going. Naomi: Well, then I’ll wait. 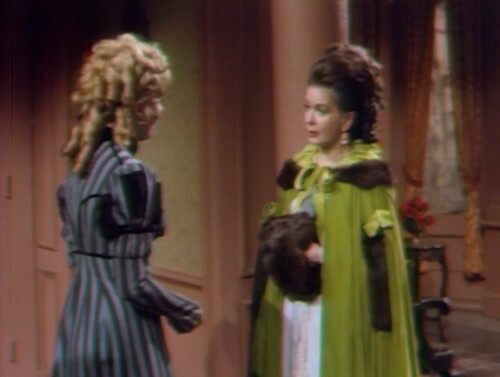 And because this is a sitcom, Naomi doesn’t notice Angelique’s increasingly alarmed tone. Angelique: Oh, please — he — he didn’t say when he would be back. Naomi: Well, it doesn’t matter, I’ll wait until he does. Angelique: I mean, he’s — well, he’s left town. He’s gone away. Naomi: Where did he go? Angelique: I don’t know. He didn’t tell me. Mrs. Collins, I really don’t know. Luckily, there’s a commercial break coming up, so Angelique will get a minute to come up with a better story than that. Possibilities include: He’s rehearsing a new vaudeville act, he’s got a job at a chocolate factory, or he’s gone to fetch a doctor to help his mortally-wounded long-lost twin brother who’s upstairs in the bedroom and happens to respond to the name Barnabas. Meanwhile, Barnabas knows we’re heading toward a break, so he uncovers his gaping neck wound just to make sure we remember what it looks like. After the break, Angelique is still struggling. Naomi: Are you sure Barnabas didn’t say where he was going? Angelique: I asked him several times. I didn’t want to make him impatient with me. He refused to say. Naomi: Well, when did he leave? Angelique: Last night. Well, that is — early this morning. Naomi: Well, did he say why he was going? Angelique: No. He said neither where, nor why. I — I didn’t think it was my place, even though I am his wife, to insist that he tell me. Spooky subtext aside, it’s really a very mundane situation, and I know that I’m currently focusing on this conversation far beyond its innate power to grip. But this is what happens when you’re making an innovative, high-intensity supernatural melodrama on a daily soap opera budget. Sitcoms and soap operas are inherently intimate, and domestic. They have a couple of standing sets — usually a living room, like this one, and a public place like a bar or an office reception desk, where you can scatter some decorative extras around in the background. You throw two or three actors together, and once you set up the situation, you let it play out in real time. Looking at this setup, the audience instinctively knows that we’re not going to cut away to a high-speed car chase through the south of France anytime soon. We’re sticking with this scenario until Angelique manages to shoo Naomi back out the door. So when Naomi steps into the drawing room and locks eyes on the enormous grisly bloodstain, you know that Angelique isn’t going to summon a portal to the nether realms. She’s going to make some kind of excuse that Naomi will only partially believe, and then something will happen that distracts everyone. The shared cultural expectation of how a scene in this style will unfold exerts a tremendous gravitational force on the narrative, even on a show as cheerfully demented as Dark Shadows has become. You can have as many zombies as you like in the recurring cast, but you’re always going to be embarrassed in front of your mother-in-law. 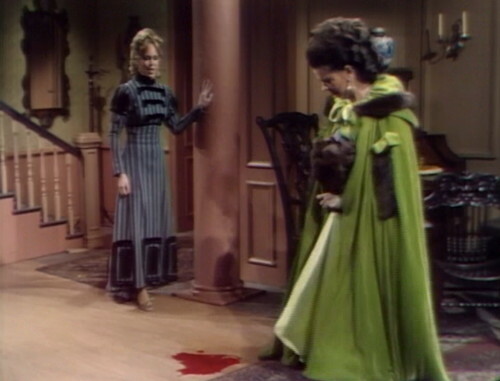 Unfortunately, Angelique chooses the one explanation that she can’t get away with — she tells Naomi that it’s not blood on the floor, it’s just wine that she spilled when she was tidying up. Naturally, Naomi doesn’t believe that for a split second; if Naomi Collins is familiar with anything in this world, it’s how wine looks when it’s spilled on the floor. This is her wheelhouse. But the sitcom gods are smiling on Angelique today. Upstairs, Barnabas hears his mother’s voice, and stumbles to his feet, trying to reach her. Grabbing a passing credenza for support, he knocks a brush to the floor with a clatter. Naomi is successfully distracted, and at this point it’s child’s play for Angelique to make excuses about the creaky old house, and then give the mother-in-law a gentle nudge towards the exit. Obviously, this is all just time-filler; we’re going to get a lot of this for the next couple of days. By any rational approach to pacing, Barnabas should already be flashing his fangs at passing streetwalkers and creating mayhem. But it’s a daily show, so they’re saving the big moment for Friday afternoon, and so far we’ve only managed to make it through the first seven minutes of Tuesday. I wonder how it’s going over at the chocolate factory? Angelique brings Barnabas a tankard of anti-vampire potion, but the tankard is obviously empty. They didn’t even bother to put water in it. You would think that with her vast ability to create potions that control life and death Angelique would be able to mix up something to get stains out of the rug. Also another thing thats been bothering me is this obsession Barnabas and Angelique have with having the ‘love of their lives’ come to them ‘of their own free will’. Wouldn’t it be easier to use their powers to make their loved ones reciprocate their feelings rather than to kidnap, terrorize or curse them into a relationship? They both share the delusion that this is the way to have others ‘love’ them willingly. I realize it’s just to fill time that she doesn’t, but couldn’t Angelique of yanked the rug that’s right THERE over the stain or moved a piece of furniture or something? 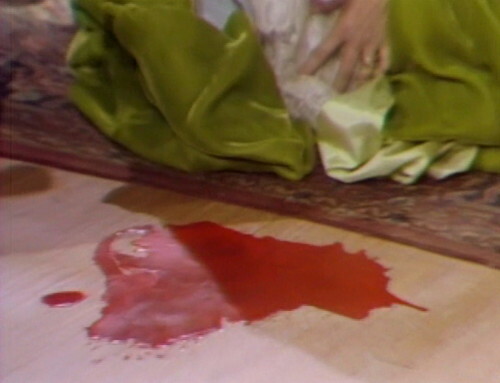 They could have at least had Natalie trip on the carpet flipping it up to reveal the stain. And if it’s important to Angelique that Barnabas lives shouldn’t she do something other than leave him alone in bed upstairs? Heck my grandmother would at least have prepared a bread and milk poultice. I think this shows how Angelique doesn’t really care that much about Barnabas. Her primary mission is still covering up. If she really loved Barnabas she wouldn’t have left his side. Your quotation of Angelique and Naomi’s conversation really shows how conversations have often worked on DS (and probably other soaps). I see this is a Ron Sproat episode, so maybe this is his particular “talent.” Basically, the conversation keeps saying the same thing over and over. If you boil it down, they’re basically saying “Is Barnabas here?” “No.” “Is Barnabas here?” “No.”–over and over again. Or if you think that’s unfair, something like this–“Is Barnabas here?” “No.” “Where is he?” “He’s gone.” “Where is he?” “He’s gone.” I noticed many conversations like this in the Jason McGuire blackmail story as well as the conversations between Maggie and Willie while Maggie was being held in the Old House. They would really just say the same thing over and over again, and then come back the next day and start all over saying the same thing over and over again. Kind of like me saying “saying the same thing over and over again” over and over again. My problem with this is, it’s a color TV show, yet the color of blood changes every time. When Angie bleeds, or Josette bleeds, it’s thin and without much color. When it dries, it turns bright. When it’s in a champagne glass, it’s tomato juice. Only when Barney returns after his First Feast do they use stage blood, which I’m guessing would be the last cuz kids are watching…..Really? The color is what they worry about????? Meet Angelique, whose powers are nearly limitless and also very limited at the same time. With that neck wound, Barnabas is going to have some serious ‘ring around the collar’, and Angelique doesn’t have a lot of skills with bloodstains; on the other hand, she HAS bounced back nicely from her grisly shoulder wound. That she got a few hours ago. Sorceresses, huh? They can make a guy into a bloodsucking ghoul, but they can’t brew a coffee I like without caffeine. Why wasn’t Sarah injured by the doll stabbing?